Our client was having a new extension being built and wanted to use an existing brick external chimney (which became internal after the extension. With a kitchen one side and a snug the other, they wanted a double sided stove so they could enjoy from each room. Efficiency and insulation were important on the build, so during the build process we installed an external air duct under the new floor, which directly fitted to the appliance, meaning no ventilation to the room was required eradicting open ventilation and drafts. We also installed hot air flexi ducting to the Snug and open plan kitchen diner. Finally, we used a mechanical chimney fan to extract fire fumes as the chimney was particularly short and would not have supported a fire this size normally. 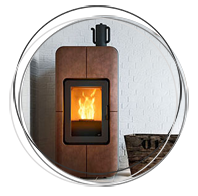 The stove was sourced directly from Spanish manufacturer ROCAL as the sizes and dimensions were crucial for the fireplace.